I love this part of Suffolk. The area west of Halesworth is one of the most rural parts of East Anglia, and Chediston is one of its least known villages. It is always a pleasure as the days lengthen in early spring to get back in the saddle, cycling around the parishes I had originally visited for the Suffolk Churches site back in the 1990s, and which I have enjoyed revisiting a number of times since. As on the last occasion I came down the long lane from Wissett, up over the ridge and then dipping down into Chediston, the church tower appearing for the first time on the rise ahead. The site suggests ancient origins. Small houses bound the churchyard on all sides, and the track to some of them actually goes through the churchyard. There is an intensity to the church's integration into its village, and so many rural English churches must have had settings like this once. The sparsely elaborated tower and cemented walls of the nave and chancel make the church feel at first a bit austere, especially if you've just come from one of the pretty round-towered churches in this area. In fact, the base of the tower is 13th century and the top was rebuilt towards the end of the 15th century, but the unbuttressed sides still seem more primitive than those of some of its contemporaries. There is some evidence of Norman work in the nave walls, but the overwhelming feeling is of the decorated period. With one important exception, the nave windows are set with clear, 19th century quarries, and so this part of the church is full of light. The fine East Anglian font is in excellent condition, its lions and woodwoses standing proudly. It is very like the one over the ridge at Wissett, and they were probably carved by the same hand. When the church was restored in the 1890s, the head of a large St Christopher was revealed by the removal of some plaster. Unfortunately, one of the windows was punched through him before this exposure happened. This is interesting, because the window was probably inserted in the 15th century. This suggests, as elsewhere, that wall paintings were not victims of the Reformation, but were in many places covered over perhaps a century earlier. The Victorian restoration here was roughly contemporary with the lunatic restoration at nearby Cookley, from which the beautiful pulpit here was rescued. It has a grand stairway, with the date 1631 on it. Mortlock observed that it was probably produced by the same person as that at Rumburgh. The nave has two striking furnishings, each of which is worth a visit on its own. 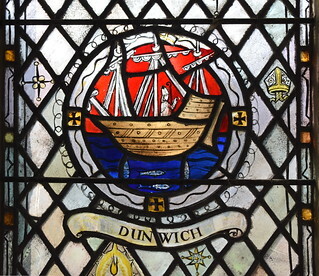 The first is the war memorial window of 1949 by Margaret Edith Rope. It depicts St George and St Felix, and if the figures seem a little doll-like then that was her intention. 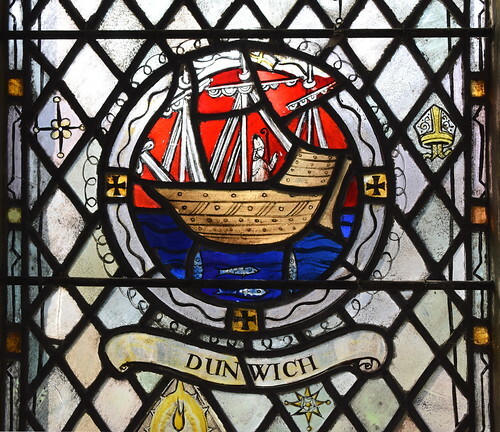 They stand above the arms of the RAF Bomber Squadron and the seal of the Borough of Dunwich, for there is a persistent belief, without any evidence, that Felix's see, Dummoc, had been at Dunwich. The loveliest feature of the window is that it contains rural Suffolk scenes in the background, ploughing behind St George and harvesting behind St Felix. East Anglia has a number of surviving decalogue boards from the 17th century, and Chediston's is probably the best. Moses and Aaron flank the Ten Commandments from the Book of Exodus. They both look very serious. Moses wears his horns of light, while Aaron wears what might be taken as either eucharistic vestments or masonic regalia. The sixth commandment exhorts us to do no Murther, while the seventh presents Adultery in a flowery script, perhaps the artist's subliminal suggestion of its potentially attractive possibilities. The chancel, is home to Chediston's remarkable early 17th Century communion rails, acorns suspended above spikes that look as if they might impale the fruits as they fall. They are properly Laudian, designed to guard the altar and keep out dogs. The Puritans hated this kind of thing, perceiving that the manner in which they cordoned off the sanctuary was an attempt by a movement within the Church of England to take the nation back to Popery. They are exactly the kind of thing that led to the English Civil War, a strange thought. Revisiting so many churches over several decades I find something reassuring about finding how little has changed in them when I know how much has changed in my own life. There is a danger in this creating a kind of vicarious nostalgia, for I am increasingly conscious of the gentle ripples caused by the Church of England as it pushes itself in new directions, reinventing itself for changing communities, reborn or transformed or, at a small number of churches, beginning to die. What I felt revisiting Chediston was something steadfast, a sense of confidence rooted, not so much in theology, but in being a touchstone to the village and its people down the long generations, past and present, and intending to still be there for the future, too.